PS4 and PS3 versions tested. Telltale Games is wrapping up its second season of 'The Walking Dead' in a week or so, no doubt plunging poor Clementine into the most dastardly of scenarios. You'd think that spending the waiting period playing a round of pinball might lighten up the mood a bit, but that's just not what Zen Studios, in collaboration with Telltale, wanted for poor you. With 'The Walking Dead Pinball,' headed to every version of Zen Studio's pinballing platform, they wanted you to again feel all the horrible feels of the stellar first season in snippets of the dire, the surreal and the touching, all the while chasing a high score. 'Around Every Corner,' on the other hand, throws you into a sniping mini game, where you guide the sight left or right along a set path and shoot zombies, Old-Western Carnival style, again, reminiscent of the watermelon toss in 'PvZ.' Other mission objectives are a little convoluted, requiring multiple steps to victory, so it's a little bit annoying having to look at the scoreboard to figure out what to do mid-mission. One might consider that a part of the difficulty though. So, with a fairly familiar structure, I was able to jump right in and go after missions without a hitch. They're tough at first, but as you acclimate yourself to the orbits and objectives, you'll come ever closer to completing each and every episode. That's the end goal, aside from the high score. Another element that gets thrown in, of utmost important to the original series, are decisions. When you grab a mission, before it starts you're prompted to make a call. Side with Kenny or Larry, Save Carly or Doug, take the food, etc. These are all choices swiped directly out of the campaign, and even something as subtle as whether you high five Duck is going pinch players of the original series right in the gut. Okay, maybe high fiving Duck is especially pinch worthy. If you're nodding your head in agreement right now, you'll enjoy the table. 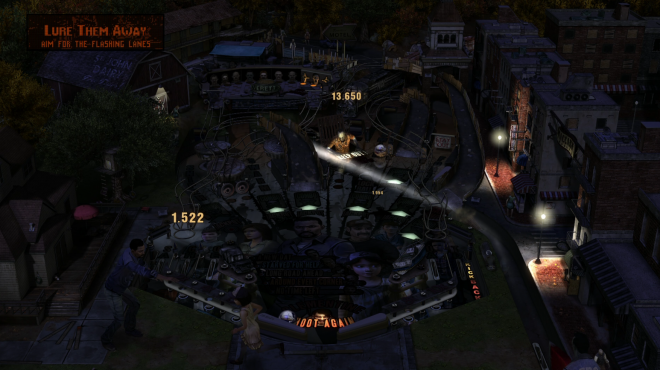 Honestly, though, the payoff for decision-making is essentially null on the pinball side of things, so I consider it as much a cosmetic inclusion as Lee and Clementine on the outskirts, but it's an important one. As far as the (virtual) physical construction of the table goes, there's nothing too radical going on here. The Everett Pharmacy serves as the primary diversion from the regular objective-hunting, with your ball caught in a tiny little arena, mini-bumpers at your disposal to take down a board of zombies. A couple of video-gamey elements, like 'Plants vs. Zombies,' are present as well. Already mentioned are the sniping mini game and hordes of zombies trouncing the table. It doesn't go much beyond that, mostly keeping in tone with the realism that makes 'Zen Pinball 2' such a treat for enthusiasts. Mostly, it makes physical sense while taking advantage of the fact that it's a video game. As with most Zen tables, the balance is pitch perfect. The only real hitch in construction is, upon losing your ball to an objective or some kind of portal, the kickback into play is just a wink too swift, causing me early on to lose balls as I was reading the scoreboard for the specifics of my next move. Acclimation is all it takes to overcome this problem, but it does result in some early frustration. I'm always appreciative of a table that tries to contextualize the score hunting, and Zen has, yet again, done a wonderful job of taking advantage of the license at hand, as the payoff really isn’t the score here. The payoff comes to those with remembered fondness for the original game. Admittedly, that's probably a lot of people. 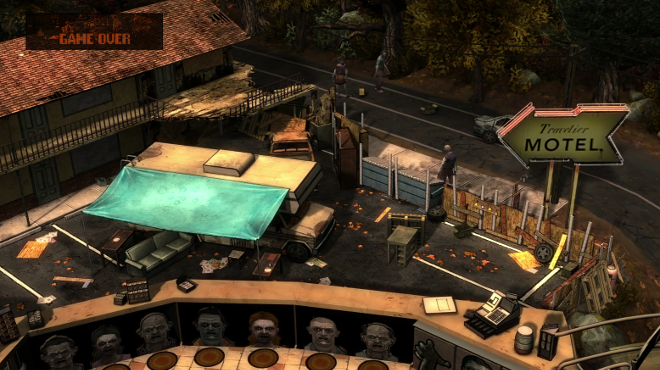 As a complement to the very best parts of 'The Walking Dead: Season One,' 'The Walking Dead Pinball' is surprisingly competent, even clever, in the way it brings those memories back. Fully animated figures of Lee and Clementine sit at the bottom corners of the table, interacting in accordance with the back-and-forth of your silver ball. Missions will see Lee walk over to Clementine to protect her, while the "Make them Smile" objective has them actually kicking a soccer ball back and forth while you try to hit your own soccer ball up required ramps. That Zen was careful enough with the property to concentrate specifically on the smaller moments between Lee and Clementine is a welcome touch, as it reminds us all just how important that relationship was to the original game. But it's not just Lee and Clementine that go recognized. So many moments from the season pop up here and there, whether it’s physical replications of the Everett Pharmacy and St. John Dairy Farm on the table itself, or the toll of the bells as you lure walkers away. The table even gets a little creepy with the lights turned out and Clem and Lee grasping at each other, the responsibility fallen on you to save them by completing objectives. Yes, that biting theme song is there, and yes, you remember to trials of Lee and Clementine intimately when the violins cry. Thankfully, the arcade dings and dongs are kept to a minimum in favor of a subtler tone. Sound bites from characters happily range from the major to minor. I may wince every time I hear Kenny go all belligerent, but I know plenty of you out there will cheer with joy. Even Omar and Charles the hobo get their licks in. It's a loving little package. 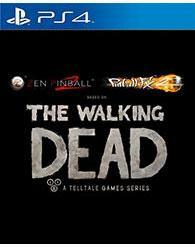 With many routes to a high score, and many sights to see along the way, 'The Walking Dead' enthusiasts will get the most out of this table, but pinball purists will find some challenge as well. Pass-and-play multiplayer and leaderboards accentuate the package.